Former Los Alamos employee Len Trimmer says what helped him speak out against the lab was the end of the Cold War. "No one wanted to drop another bomb"
Workers at Los Alamos National Laboratory (LANL) are a special breed: Not only do they work with the most dangerous objects on the planet, but most of them believe in what they are doing and are unflinchingly loyal to their employer and its mission of national security. Now, however, some former workers are asking for help from the nation they served. Passed by Congress in 2000, the Energy Employees Occupational Illness Compensation Program allows federal employees to file claims if they became ill as a result of their work with radiation, beryllium or silica. If their claims are approved by the U.S. Department of Labor, they or their families can receive payments of $150,000. As of the end of September, 3,714 claims had been filed by workers from Los Alamos; only 61 had been approved and paid. This slow response has been frustrating for workers. In May 2002, Ken Silver, a professor of environmental health at Eastern Tennessee State University who wrote his doctoral dissertation on the health effects of the lab, held a meeting in Española with former Los Alamos workers, along with Sen. Jeff Bingaman, D-N.M., Rep. Tom Udall, D-N.M., and representatives from the Labor and Energy departments. At that meeting, former employees (and the widow of one former contractor) testified about their work at the lab, about the lab’s reluctance to admit to any problems, and about the difficulties they faced gaining access to their own medical records. Ben Ortiz worked in the lab’s Neutron Science Center from 1969 until 1989. There, he dealt with chemical agents such as trichloroethylene, trichloromethane, acetone, freon and nitric acid. "In 20 years of employment with LANL, I never had any safety briefing on the hazards of chemicals," he said at the meeting. "I was told that no one gets sick at LANL." When he became ill, Ortiz said, he was told by lab personnel that "it was my imagination, phobia, that I was practicing witchcraft, and that I abused drugs and alcohol." Ortiz finally saw a doctor at San Francisco General Hospital, who diagnosed solvent encephalopathy and restricted airway conditions —- medical problems not covered under the occupational illness act. Alex Smith worked at the lab’s chemical warehouse from 1947 until 1982. During his early years there, Smith operated a mercury still, heating the toxic liquid metal until it became pure mercury. By 1948, he had developed health problems, and was treated by the lab’s doctors. But when he retired in 1982, the lab had no record of his illness — nor of the fact that it had shut down the mercury still. Smith had no evidence that he had ever been exposed to or gotten sick from mercury — until he met Ken Silver. Silver dug through Energy Department documents and found a series of letters from the doctor who had ordered the mercury still closed. Smith was finally able to prove that he had been exposed to mercury — but mercury-related illnesses like his are not covered under the new federal law. "There has been progress, but it’s been because of very courageous people who have been willing to resist the lab," says Silver. "But these people don’t get nearly as much attention as the Manhattan Project folks." People who challenge the lab, he adds, can lose their jobs — or, worse, are accused of being a threat to national security. Len Trimmer, a 28-year veteran of the lab, also testified at the Española meeting, challenging Bingaman and Udall to look into worker safety at Area G, where everything from asbestos to plutonium to freon is stored. Trimmer said he gave Sen. Bingaman a video that showed workers at Area G, wearing civilian clothes and lacking respirators. The Energy Department and the University of California are dismissing worker claims, he told High Country News this summer, because if they ever admitted what a health risk the lab poses to its workers, it would open a "Pandora’s box." The Atlanta-based Centers for Disease Control has tried, unsuccessfully so far, to lift the lid on that box. 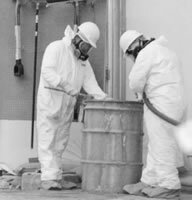 In 1999, with congressional funding, the CDC began studying historical releases of radioactive and other toxic chemicals at the lab, gathering lab documents to eventually develop a "dose reconstruction." But a year later, citing the Wen Ho Lee scandal — in which a Taiwanese-born scientist at the lab was wrongly accused of passing secrets to the Chinese government — and the Cerro Grande fire, the lab stopped releasing classified documents to ENSR International, the researchers hired by the CDC. Under "special security plans," ENSR has since been allowed limited access to the records. But according to Peter Rasco, ENSR’s contract director, lab officials decide which documents researchers can and cannot see, and two-person teams are escorted into the archives. Last February, ENSR released a draft report, and is now working on the final report. A public meeting will be held in Española in January. To read A Summary of Historical Operations at Los Alamos National Laboratory and Associated Off-Site Releases of Radionuclides and Other Toxic Materials, log onto www.shonka.com/ReConstructionZone/ pubs/lahdradraftv2g.pdf.